We had perfect weather for our spring work hike at Smugglers' Notch. Nine people gathered at the picnic area near Barnes Camp Two drove up to the Notch and hiked up to Chilcoot Pass in order to remove a fallen tree that Fred J reported after a scouting trip, while the remaining seven crossed Notch Brook and walked varying distances up the trail, clipping growth both high and low, and cleaning waterbars. No one went as far as the side trail to Elephant's Head itself; that trail is closed now, to protect the nesting peregrine falcons. 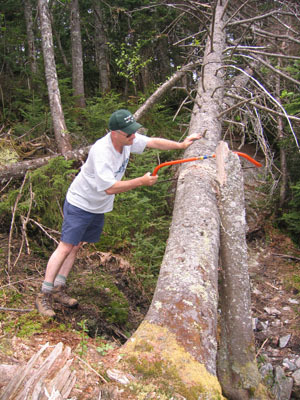 Dave and Mike reported that the new 30-inch bow-saw did not work as well as hoped. A better blade might help. They also reported broken puncheon above the shelter. For these nine people, total travel time was 15 hours, work time 51 hours. Mike and Dave hiked up the Sterling Pond Trail for their work project. The trail was in fine shape to the Sterling Pond Shelter, which was also just fine. Trail north of the shelter we began encountering numerous small trees across the trail. Some were deadfall, others more recently alive that were downed by wind or snow loading. All were easily carried off the trail or cut with a small bow saw. We had some short but nice glissading on a late patch of snow descending from Madonna Peak. 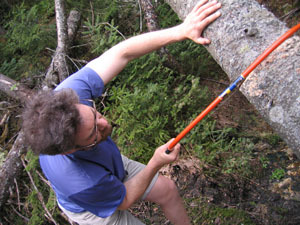 Dave's hopes for some heavy duty work were satisfied about a hundred yards shy of Chilcoot Pass, where a 15-18" tree had lost its grip on the earth and tipped over, munching about six smaller trees, and hanging up in another. The 30" bow saw was a bit wobbly and loose, but we took turns at the initial cut. The beast was incredibly resistant to breaking, and it took a final firm whack with a hazel hoe to tear trunk from stump. Lots more chopping and heaving cleared the trail and left a substantial mountain of debris downhill. The great tree battle took two hours. On our way out we trimmed numerous low branches and cleaned out waterbars.